At KOMPAN, we believe that every child should have the right to leisure and play – regardless of their physical and intellectual abilities. This belief is in line with the United Nations’ Convention on the Rights of the Child, the most widely supported UN convention ever. Over the last few years, most nations have signed the United Nations’ Convention on the Rights of Persons with Disabilities, which recommends that public spaces be designed in accordance with “universal design” principles. 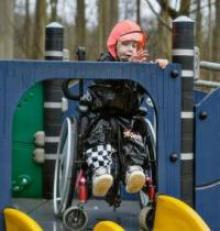 The belief in inclusive play runs deep at KOMPAN. “Play Together” – or the idea that everyone should be included in play, is a foundational pillar in our philosophy of play. 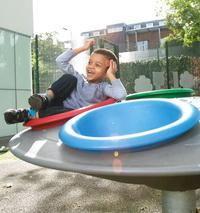 We design our products to be used universally and to accommodate activities that are relevant for all children. You will find universal design everywhere in our playgrounds, not least in the many openings and details that encourage play exchanges between children inside and outside the play elements. KOMPAN product innovation is guided by the following five principles for universal, inclusive design.